Good day to all you Studebaker owners out there. 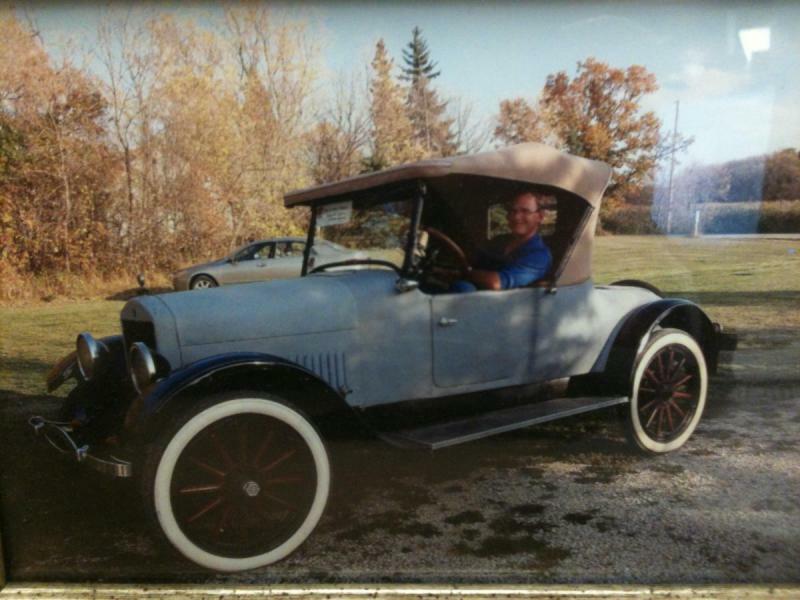 I have inherited a 1921 – 1923+ “hybrid” Studebaker Roadster from my father and I am trying to complete its restoration. I say hybrid because the engine S/N is 33980, the chassis S/N is 1,020,078 and the body S/N 100,054. The body has a cowl vent, side lights on the windshield frames and rectangular holes where the rain shields get installed. It has a Wagner starter (EM356A), Wagner generator (EM-355) but has a Remy coil and Remy 626K (1925?) distributor mounted on a 45347 -2 distributor support bracket with 14/5 tooth igniter gears. I will be asking members of the forum for assistance in obtaining mechanical parts that I will need for its restoration and for obtaining your input on technical assistance that I will most certainly need. My more immediate needs would be for mechanical type parts and in particular for ignition/timing components. While the car does run with the parts it has, I am hoping to find a set of 1923 EM Type 45 timing sprockets with the 15 tooth accessory drive sprocket. (42-21-15) as this would match the current igniter gear ratio of 2.8 to 1. (I understand from the paperwork I obtained that the car current has a 1927 – 15 tooth sprocket installed that has been badly damaged after only about 40 hrs of operation). Another option I have would be to source the earlier distributor support bracket (43572 or 45183 and igniter gears in a 15/5 configuration compatible with the Remy 626K ) as I do have the original (42-21-14) sprockets and timing chain for the motor (Casting date 91721). 1. A set of good condition 1923 EM timing sprockets they are willing to part with? 2. Earlier distributor support bracket and 15/5 igniter gears that they are willing to part with? There are quite a few timing chains in these bins. If you or a friend can come down to Joliet Il. that would make it easier. It is hard for me to find items because I am old and slow. Thank you for responding to my post. I live in Calgary Canada and have the car located on a farm about 5 hours drive north from Calgary. The option of going to Joliet later on this summer is a possibility although it makes for quite a round trip from Calgary. Is it possible for you to do a little digging at your own pace of course to see if you have the 42-21-15 sprockets? It would help make the trip more worthwhile from my perspective? Do you have a parts book so you can give me part numbers? a lot of parts in these 20 some totes have part numbers. I may have some extra parts books if you do not have these. to the right people but I need help with this. I am in a wheelchair most of the time and only can walk a short distance. Any volunteers in Northern Illinois? I have the 4 Sections of the 1919 to 1922 Parts Manual and the Light Six Service Manual but unfortunately do not have a parts manual for the 1923 EM's which is what I would need for getting numbers for the timing sprockets. The Light Six Service Manual (Insert No 60) indicates that "beginning with the 1923 EM Series cars at S/N 1,084,001 a new chain designated Type 45 was introduced. All sprockets used with the new chain will be stamped "Type 45" on the front face. 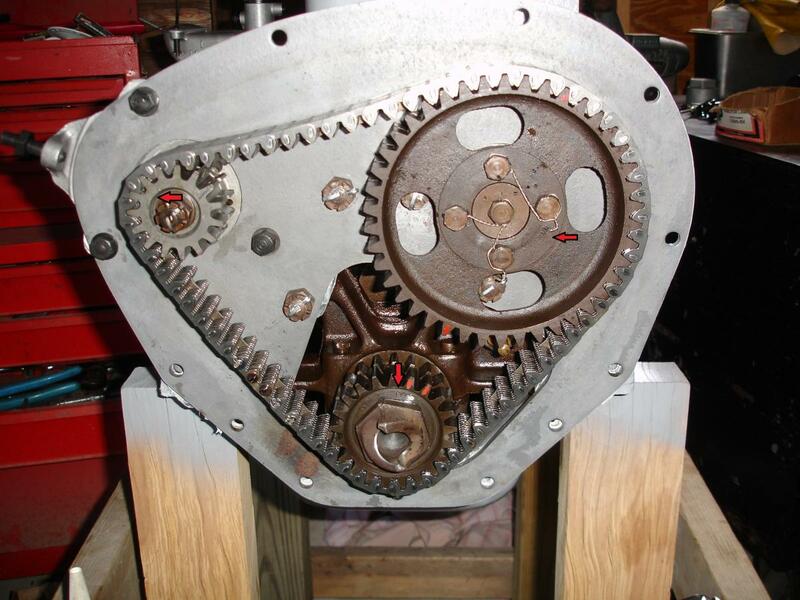 The new accessory shaft sprocket has 15 teeth instead of the original 14 teeth." What I would need is the 42 tooth, 21 tooth and 15 tooth sprockets with "Type 45" stamped on them. Thank you for the contact information. I was in touch with Tom late last year and managed to procure a 626K distributor cap, rotor and condenser from him. He was definitely great to deal with. The cam shaft sprocket is part number 120006. The crankshaft sprocket is part number 120011. The accessory shaft sprocket is part number 120012. As for the timing chain. According to the parts book the morse chain and all the other types that followed on the standard six , Ge etc. are interchangeable. It looks like someone has installed an EM oil pump / distributor / generator setup on your EJ. I have a full set of EJ sprockets along with a 4 lobe distributor drive gear if you can't find what you need and want to revert to the 1920-22 setup if the sprockets you have are messed up. They are all in excellent shape. I also have the distributor support housing with the older drive gear. This all came off a 1922 engine, although it was fitted with a Delco Remy distributor - probably off something from the late 20s. I also have a Wagner coil if you need one. I know Robert has several Wagner coils. Robert should have a Morse Type 45 crankshaft drive sprocket on the end of a worn out crankshaft I gave him. I know I didn't give him a cam sprocket but he may have the Type 45 accessory drive sprocket. Thanks for responding to my post. I am interested in obtaining the distributor support housing with the older drive gear and a distributor gear as I believe I do have original sprockets and chain (I say believe, as neither the sprockets nor the chain have any identifying markings on them) (PS. You are dealing with a novice here who knows very little about old Stude's). Could you send (gpruden@telus.net) or post a couple of pictures so that I can better visualize the components? I am interested in your comment about "4 lobe" drive gear? - did the EJ's have a 12/4 (3.0 ratio) ignitor gear arrangement. (In my original post I mentioned a 15/5 setup which was maybe incorrect). I have sourced a Wagner coil already and am still hoping that Robert has the Type 45 sprockets. Pics of my spare sprockets and chain attached. This is a photo of my engine (early 1923 with aluminum head - s/n EM102190) when I assembled it and the location of the "Type 45" markings on the sprockets. Note: The marking on the accessory drive sprocket didn't showed up too well but you can see it better on the disassembly photo. This should at least help with identifying the Type 45 parts. Dave may be able to answer questions on the chains. My "pre-Type 45" parts are still rather greasy and tucked away so you'll have to give me some time to dig them out. There are several chain in these totes. You bought a new chain from Dave. What are these chains for that are in the totes. If you have the older setup for Glen , what should I be looking for. Shall I remove the sprocket from the crank you brought. I just need more time to sort the totes and inventory these. A couple of those chains are tagged but I believe they are all used - may not all be Light Six. Glen is looking for the 1923/24 sprocket setup that uses a "Type 45" chain. I'm pretty sure the sprocket on the end of that crankshaft should be marked "Type 45" (see photo I posted for locating). If so, then I suggest removing it. You should find a couple of other accessory drive sprockets in one of those bins. If it has 15 teeth it is a "Type 45". If it only has 14 teeth it goes with the older chain design (1920-1922). I don't recall a spare cam sprocket in those bins but I may be mistaken. If you find one just look for the "Type 45" stamp. Unfortunately, only a few castings would have part numbers cast in. The rest of these old parts generally have no markings and are just piled in boxes. Most people's collections from the 1920s are this way so unless you know exactly what to look for it is hard to identify. The only usefulness I found for part numbers is to identify which model years and models might be common. Here is a good example...Studebaker right rear fenders. What year? What model? What body style? 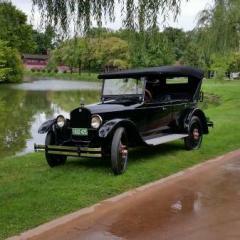 I have no idea, just know it is from a 1920s Studebaker so unless you have something to match it to, it's a crap shoot. I will remove that sprocket from the crankshaft if Glen found the other parts needed and that sprocket is the last item needed. I will look through my other light six parts early next week ,wen I go back to my shop. Prayers and best wishes for your wife's surgery and speedy recovery. At that age just the anesthesia is a risk. Take care of the important stuff. Agree entirely with Scott - family first then hobby/business. I am not in any urgent rush for the three sprockets. Best wishes for your wife's surgery and recovery. When I worked on the timing chain on my 1924 light six I went through the studebaker parts books. The same sprocket part numbers for the later EM are used all the way up to the end of that family of six cylinder engines. An example, cam shaft sprocket part number 120006 according to the 1928 to 40 six part book was used on: GE, GJ, GL, S1, 53. Older parts books also show this part number for the standard six and EM. The same is true for the other two sprockets. The parts book shows a number of different chains by different manufacturers but the same sprockets were used for at least 10 years. They list each new chain type as superseding the previous one. I ended up removing the hunters link from my chain as per the repair manual. That took care of the slackness issue. Thanks Studeboy for your contribution. I am happy that Glen is not in a hurry so we can solicit more contributions. I have been able to help several people with parts that Scott saved and hopefully I can set up a webpage with pictures of the parts in the 20 or so totes he brought down. I wonder how many members have experience in working on these Light six engines. that I have not been able to find the serial number but has an aluminum accessory bracket. What years had different accessory brackets and when did they go to cast iron? As a side note, my wife has always been a Studebaker supporter and never complained about my hobby of saving parts and even was secretary of our local SDC chapter. Thank you Studeboy for providing more background information on the sprockets.